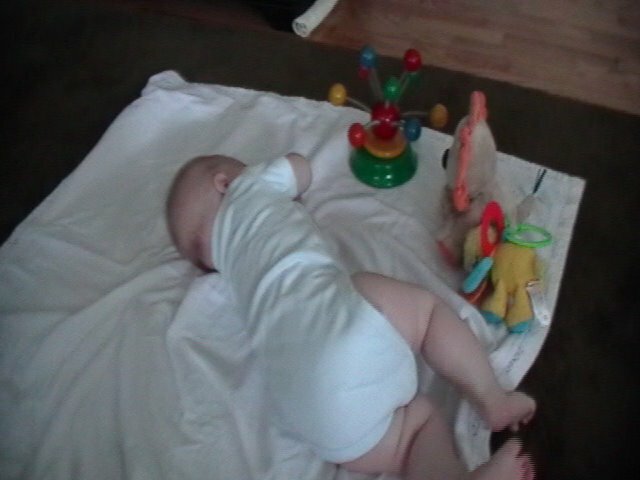 Zach has recently started trying to roll over. He first would just kick his legs into the air but now he kicks them and falls to one side. He is not really all that into it, and some days he has no use for being on the floor and would much rather be sitting in his bumbo. I did catch a few attempts at his roll- and I was sure he was going to do it fully, but alas, no luck. He gets caught on that arm underneath. His buddy Wyatt does the same thing, but Wyatt has figured out how to roll onto his arm and keep going. Not my little smarty, he just gets stuck and stays there.